Mad Men may be the ultimate critical darling and The Walking Dead a relentless devourer of GRPs, but the most transformative show on basic cable is actually a broadcast hand-me-down. According to Nielsen ratings data, Warner Bros.’ The Big Bang Theory is now the most-watched comedy on cable, drawing north of 3 million viewers per episode on TBS. Since making its cable premiere on Sept. 20—an 8-11 p.m. prime-time road block averaged 1.55 million viewers—the Chuck Lorre sitcom has sent TBS’ fortunes soaring. In the first quarter of this year, TBS accomplished something that hadn’t been done in six years, unseating reigning champ USA Network as the top-rated cable entertainment channel among adults 18-to-49. Through March 25, the Turner net averaged 1.22 million members of the dollar demo in prime, marking a 33 percent improvement from the year-ago 923,000. The last time TBS came within shooting distance of USA was back in Q1 2010, when it finished second in the demo with 1.02 million viewers—275,000 shy of USA’s 1.29 million. TBS also knocked MTV out of the box, growing its share of adults 18-to-34 by 28 percent with an average delivery of 670,000 viewers. MTV fell 21 percent to 593,000 adults in the demo although that comparison is made against the network’s historically hot Q1 2011. In the first three months of last year, MTV soared 64 percent in the young adult demo, drawing a record 750,000 viewers. Last week, TBS aired 14 episodes of TBBT in prime and two in fringe (5 p.m. and 5:30 p.m.). The three-hour Tuesday block remains the most popular, delivering an average crowd of 2.95 million viewers, but fans also poured in for the two-hour packages on Wednesday and Saturday night. The four-episode Thursday night block was scotched to make room for Turner’s coverage of the second round of the NCAA tournament. In head-to-head competition, TBBT regularly beats Comedy Central’s South Park, Tosh.0 and Key & Peele in total viewers and the demo, and while it doesn’t compete directly with repeats of Two and a Half Men—FX airs Lorre’s other syndicated hit in fringe and Saturdays—the deliveries aren’t even close. While TBBT has invigorated TBS’ prime-time roster, the show has also given Conan O’Brien a much-needed lift at 11 p.m. After losing nearly half of its audience a year ago, Conan is rebounding strongly, averaging 726,000 adults 18 to 49 in Q1, up 18 percent from the previous three-month period. It should come as no surprise that Conan is putting up its best numbers in the middle of the week when it leads out of TBBT. Now all the comedian needs to do is work on his retention; last Tuesday, the show lost 63 percent of its TBBT lead-in, while Wednesday’s installment fell 61 percent. The TBBT bounce didn’t come cheap. Turner in May 2010 outbid FX for the off-net rights to the series, forking over a record $1.5 million per episode. 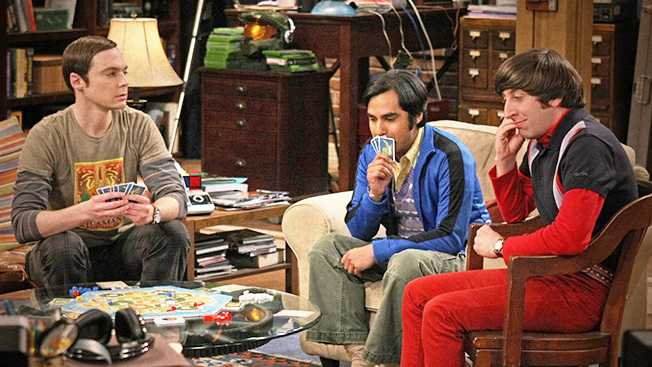 TBBT’s cable success coincides with its huge presence on CBS’ Thursday night lineup. Now in its fifth season, TBBT is the most-watched comedy on television, averaging 14.1 million live-plus-same-day viewers. It is also the No. 2 scripted series among the 18-to-49 set, averaging a 4.6 rating. CBS last year renewed TBBT for three cycles, keeping the show on broadcast through at least 2014. In addition to network and cable TV, TBBT is in widespread syndication. Fox stations carry the show in 10 markets, including New York, Los Angeles and Chicago. Despite being dethroned by TBS, USA Network remained dominant among total viewers and adults 25-to-54. The NBCUniversal juggernaut averaged 3.07 million viewers in prime, for a loss of 5 percent year over year, and delivered 1.19 million adults 25-to-54 (down 9 percent). Among the top 20 basic cable nets, the biggest winners in the 18-to-49 sweepstakes were History, which improved 15 percent in the demo with an average draw of 1.04 million viewers; Discovery Channel, which rose 9 percent to 712,000; AMC, up 33 percent to 554,000; and Lifetime, up 20 percent to 554,000. Most double-digit ratings declines were made against unfavorable year-ago comparisons. For example, MTV’s 19 percent drop was the result of an almost unreasonable comp; in Q1 2011, the network soared 62 percent in the demo, reaching 941,000 adults 18-to-49. FX experienced a similar oscillation. Over the last three months, the network fell 15 percent in the dollar demo, averaging 775,000 adults 18-to-49. A year ago, FX was up 20 percent to 881,000. If the extremes are dismissed and comparisons made against the first three months of 2010, FX actually grew 6 percent from 730,000 viewers. On the quarter, college football bowl games accounted for four of the five most-watched programs on ad-supported cable, with ESPN’s coverage of the LSU-Alabama BCS Championship Game beating all comers (24.4 million viewers, 11.3 million adults 18-to-49). The top scripted program was AMC’s The Walking Dead, which in its Feb. 12 midseason premiere scared up a record 10.7 million viewers and 7.26 million adults 18-to-49. Honors for the top unscripted program of Q1 go to the Season 5 opener of MTV’s Jersey Shore, which drew 9.31 million viewers, of which 71 percent, or 6.58 million, were members of the 18-to-49 demo.